The American trypanosomiasis, also known as Chagas disease, is an infectious illness spread by so-called “kissing bugs,” or bloodsucking cone-nosed bugs carrying a protozoan parasite Trypanosoma cruzi (T. cruzi). They bite sleeping people, injecting anesthetic and anticoagulant saliva. The bug is found only in the Americas, most commonly in poor, rural areas of Latin America. About six to seven million people worldwide, mostly in Latin America, are estimated to be infected with Chagas disease. The disease was named after Carlos Chagas, a Brazilian physician who characterized it in 1909. The disease goes by other names such as South American Sleeping Sickness and Trypanosoma Cruzi Infection. Living in poor, rural areas of low-quality housing where the triatomine bug flourishes. Working in a laboratory with exposure to the parasite. Infection may be transmitted during a blood transfusion or organ transplant. Not having a risk factor does not mean that an individual will not get the condition. It is always important to discuss the effect of risk factors with your healthcare provider. Acute-phase symptoms may be swelling and/or redness at the skin infection site (termed chagoma), rash, swollen lymph nodes, fever, head and body aches, fatigue, nausea, vomiting and/or diarrhea, and liver and/or spleen enlargement. Chronic-phase symptoms may be irregular heartbeats, palpitations, fainting (syncope), cardiomyopathy, congestive heart failure, shortness of breath (dyspnea), emphysema, stroke, chronic abdominal pain, chronic constipation, dilated colon, difficulty swallowing and sudden death. Early symptoms usually go away, but can later cause serious intestinal and cardiac complications if left untreated. Tests showed that low quantities of resveratrol, a natural antioxidant found in red grapes, peanut butter and dark chocolate, are able to kill T. cruzi in laboratory cultures. The killing effect is greater on the actual parasite that infects humans and other mammals, in comparison with the form that is carried by its transmission insect. Resveratrol is a dietary supplement available in any pharmacy; it is completely non-toxic and is easily accessible due to its low market price. Other foods with powerful antioxidant properties that may prevent this disease include garlic, grapefruit, turmeric, black walnut and oregano essential oil. There are no vaccines or medicines to prevent Chagas disease. If you travel to areas where it occurs, you are at higher risk if you sleep outdoors or in poor housing conditions. 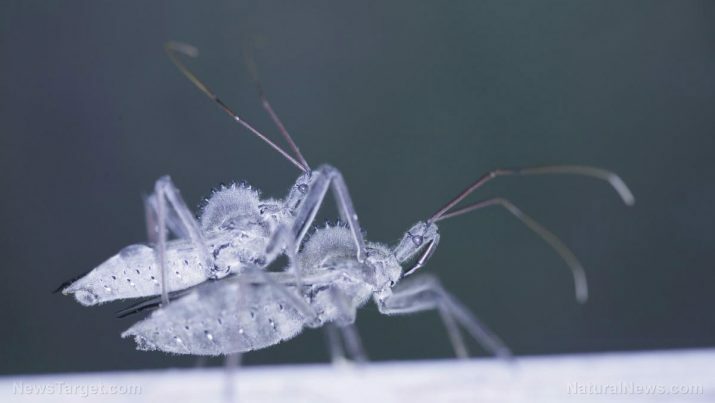 It is important to use insecticides to prevent bites, and practice food safety. The American trypanosomiasis, also known as Chagas disease, is an infectious illness spread by so-called “kissing bugs,” carrying a parasite Trypanosoma cruzi. The bug is found only in the Americas, most commonly in poor, rural areas of Latin America. Chagas disease has two phases: an initial acute phase and chronic phase. Signs and symptoms may be treated early on but can eventually lead to serious intestinal and heart problems if left untreated.